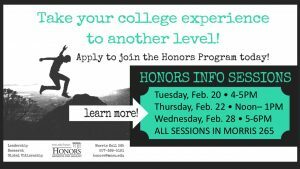 Continuing through the Spring Semester, the Counseling Center again offers a series of personal discovery workshops to help guide students through typical troubling waters of college life. The series, “Discovering Yourself,” offers sessions that tackle topics that typically trouble students. 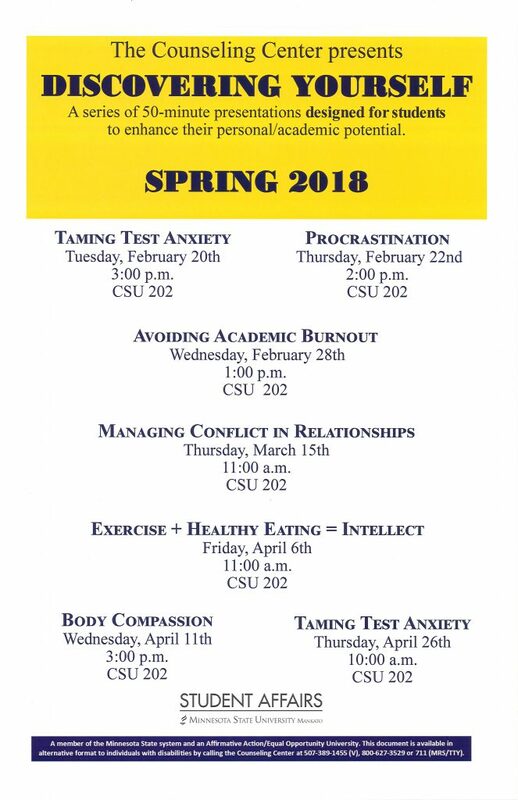 The FREE 50-minute Spring 2018 sessions in CSU202 resume this Wednesday, Feb. 28, at 1 p.m. with helpful tips on Avoiding Academic Burnout. Other topics include conflict resolution, healthy living, body compassion and – just in time for finals week – taming test anxiety. The sessions happen at different times of the day to accommodate various class schedules. Do yourself a huge favor. Check the remaining list of classes (right), choose your sessions, mark your calendars and attend. Such tips for success are never a waste of time. Also know that your Counseling Center offers students free consultation, individual counseling and group counseling to support students in resolving personal, social, educational, and mental health concerns. The Counseling Center is located in CSU 285. Fall and Spring Semester hours are Monday-Friday, 8 a.m. to noon and 1-4:30 p.m., and 7:30 a.m. to noon and 1-4 p.m. during summer semesters. What Can You Do For The Winter Blues? Winter in Minnesota seems to get colder and snowier by the day. When winter seems never ending it can hit us non-winter lovers especially hard. So when winter drags on what do you do when you’re feeling blue? 1. Mark my calendar with the things that I’m looking forward to. Crossing off days in my calendar and making countdowns gives me satisfaction and happiness knowing that I’m inches closer to something that I’m excited about. 2. Play music throughout the day. Growing up, my mom always had fun music playing throughout our house. It was very calming and it helped release the tension that was built up during a long day. Coming to college, I had a hard time playing music because I didn’t want to interrupt my roommates and their studies. Just recently, I’ve been testing the waters and playing music in our kitchen during dinner and on the weekends. It’s helped us bond and smile more frequently because we usually end up dancing and laughing as we belt out the wrong lyrics. 3. Eating well. Every single day, I start my day with a chocolate protein shake full of vitamins and an egg. Starting my day off with nutritional value creates a mindset of wanting to eat right the rest of the day, which ultimately gives me the energy to get throughout the rest of the day. Though we’re nearing the end of the cold months, it’s important to find things that make you happy and that can help lift your spirits. “It always fills me with joy when student refer to us as ‘Bridges family’.” – Kailee Steen, Bridges International president. 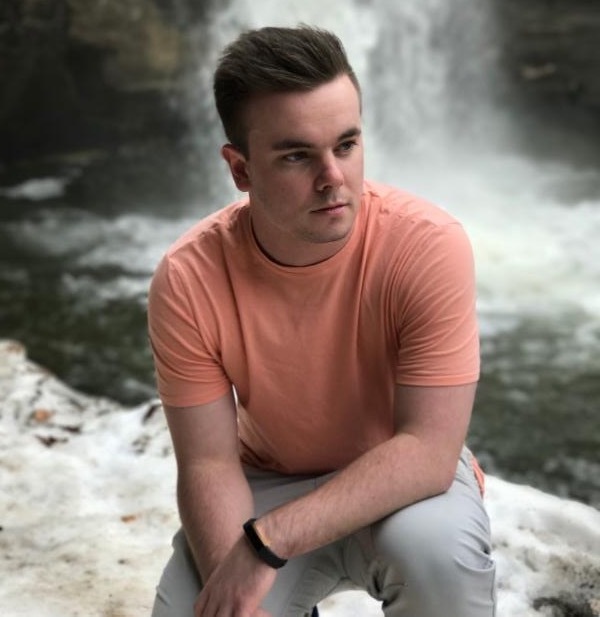 The mingling of cultures found at Minnesota State University, Mankato stretches from reserved curiosity to blatant stereotypes. One Registered Student Organization helps level the playing field through shared experiences. 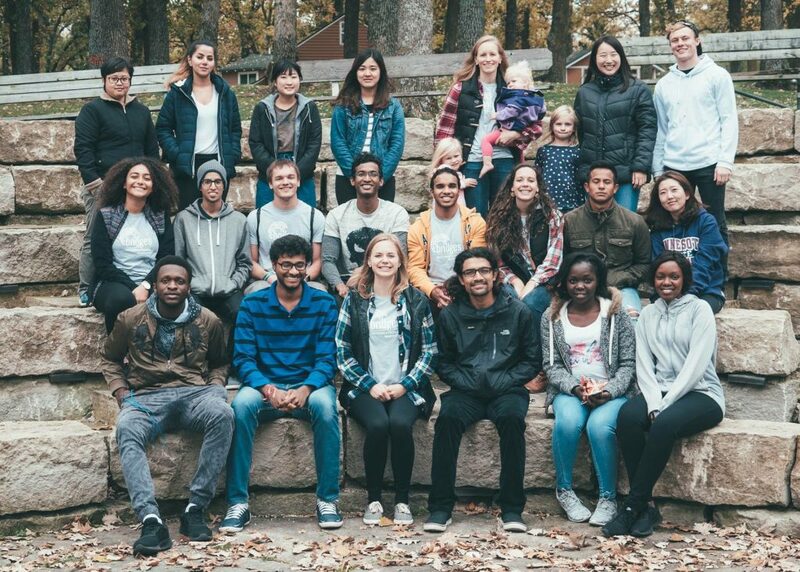 Recognized as the Centennial Student Union’s March RSO of the Month, Bridges International lives up to its name by seeking opportunities for bridging the cultural gap among students of all nationalities, races and religions. Among BI’s ongoing programs is Bridges Café, a Tuesday gathering offering cross-cultural dialogue ranging from fun to significant while enjoying tea, coffee, hot chocolate and treats. “This helps facilitate relationships and increases cultural competency among all who attend,” she said. Other social activities involve potlucks featuring foods from members’ countries. Events for experiencing American and Midwestern culture include pumpkin carving, trips to Mall of America and winter break trips to Florida and Washington, D.C. As Spring Break 2018 nears, BI members plan for a service project to Texas to assist hurricane relief. Steen said the goal is unity. “It always fills me with joy when student refer to us as ‘Bridges family’,” she said. What are your goals of your organization and how to you attain them? Our goal is to bridge the gap between international and American students and help internationals feel welcomed. We desire to foster connections, engage in conversations, help students practice their English, and serve the internationals. We attain these goals through the weekly discussions during our Bridges Cafe, meeting one-on-one with students, and creating social and cultural events and trips. These help promote opportunities for students to engage with one another facilitate lasting friendships, and experience the American culture. Through discussion, we also learn from one another. Why should someone join your organization? People should join our organization to learn about other cultures, grow in their cultural competency, gain friendships and a welcoming family, and have fun! When did your organization start at Minnesota State University, Mankato? Our organization started in 2012. How many members do you currently have? We have about 20 members who regularly attend, and about 50 members who we are in contact with regularly. How often do you meet? We meet weekly, but we also have other events periodically each month. What leadership positions can someone hold within your chapter? Leadership positions include president, vice president, scheduler, and being a member of the leadership team. What is the greatest achievement your organization has received? The greatest achievement is when students highly recommend our organization and consider us their “Bridges family.” How do you join? Anyone can join! One can start by simply attending our weekly Bridges café (meeting). Please share any other information/comment that spotlights your student organization. Our organization continues to grow each year. We started out with a minimal number of people, and we now have about 30 people regularly attending our meetings. The Right Stuff. Back in 1983, this movie about the early days of the space program focused on confident individuals getting ready to be shot into space. 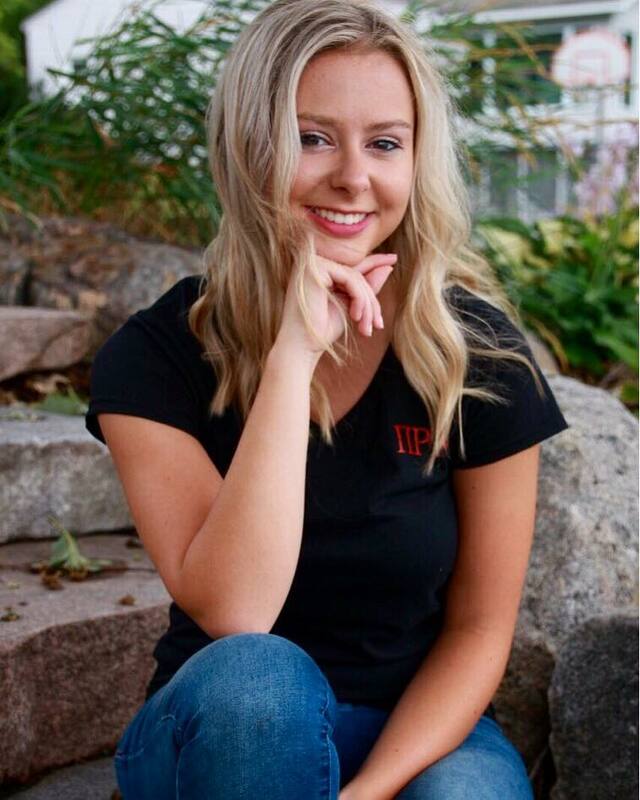 Actually, that’s a good metaphor for the Honors Program at Minnesota State Mankato – students confident they are the Right Stuff push their personal envelope with hopes for rocketing their future. In the coming two weeks you will have three opportunities to find out about the Honors Program and if its a good fit for you, your college career and your future. Motivated students selected for the Minnesota State take their college experience further than they thought possible. Along the way, they develop problem solving skills and a growing passion for knowledge. Think you’re the Right Stuff or you just want to rocket your career. Plan to attend one of the sessions or find out more about the program here. There’s a quote from Confucius that I always let resonate when thinking about my future: Choose a job you love, and you’ll never have to work a day in your life. That choice starts at college – or before college. Yet, some of us enter and move through college without a decided major. It’s one of the most important decisions you’ve made to date. That decision doesn’t come easy. It’s scary to make a big life decision like choosing a major. There’s a good chance that choice is something that’s going to shape the next 40 or so years of your life, so, yeah, no pressure. Don’t fret though. If you’re one those people having a tough time making or maybe doubting your decision, I’m here to give you some tips and links. Find and Visit This Office. The Office of New Students and Family Programs on the main level of Preska offers counseling and services to help the undecided student. Start with the handy Advising Worksheet, follow the steps for Exploring a Major and set up a counseling session. Turn to the Undergraduate Bulletin. The Undergraduate Bulletin is another great tool. It lists out every major minor at the University. Page through it and circle things that look interesting and cross out the things that look terrible. After that, write down your results and start to make some pros and cons lists and explore career opportunities within each of the majors. Visit This Link. This CDC site has endless resources on careers, majors, jobs and everything in between. Find your passion. This is my best piece of advice. Take 10 minutes to write down everything you love doing. Reading, writing, singing, math, science, sports, grammar, chemistry or whatever else it may. Find the thing that’s your favorite and see if you can find a major that correlates with that passion. Don’t let salary deter you either. Abe Lincoln can now get your non-student visitor in the door. Otto Recreation Center is now offering Day Guest Passes for visitors who want to use MSU’s gym facilities. 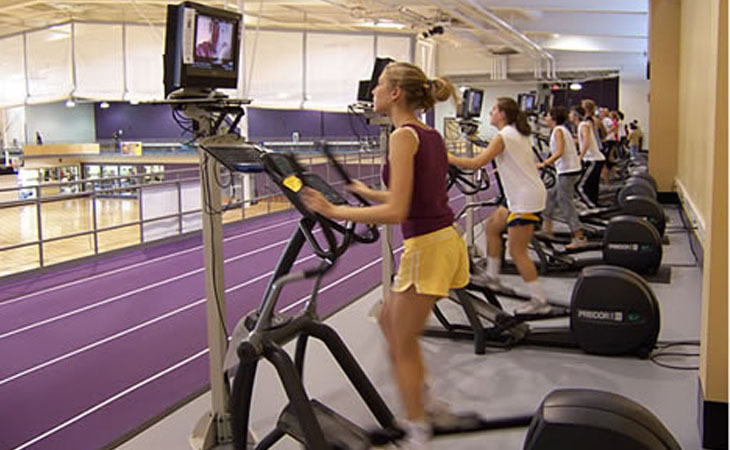 For just $5 a day, this new policy allows students to sponsor non-MSU public (18+) at the Rec Center. This is a perfect opportunity for those of you who have visiting friends and family who want to get active with you during their time on campus – because, as you know, it’s currently a little too cold to get exercise outside. Day Guest Passes give access to Otto Recreation Center, to the Highland Pool during open swim times, and the Myers Field House during open recreation times. The only exclusion is the Myers Field House climbing wall and outdoor climbing pinnacle. Guests must show a photo ID when entering and won’t be allowed to enter the Rec Center without their MSU sponsor. To purchase a guest pass and for more information, visit www.mnsu.edu/campusrec. I’ll see you on the running track (with your out-of-town friends)! 22 Free Fitness Opportunities. Does It Get Any Better? Mavericks are lining up for group fitness, yoga and meditation classes—no charge. 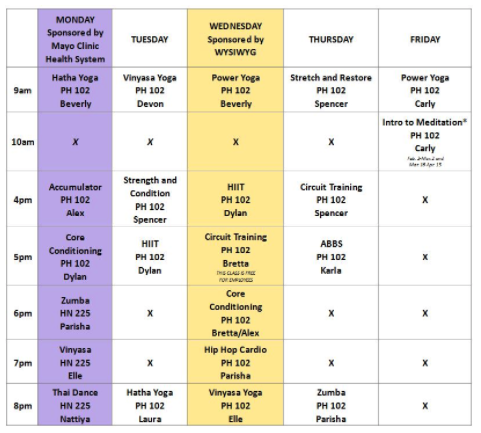 There are 22 classes scheduled through Campus Rec every Monday through Friday. Classes are typically in Pennington Hall 102 and Highland North 225, but don’t be surprised if they happen outside and even in water. Carly Hopper, program coordinator, leads the classes at Minnesota State Mankato with the help of graduate students and interns. “Classes range from yoga, meditation, core conditioning, Zumba, high intensity interval training, Thai dance, cardio-based classes, hip-hop, circuit training, strength training, and stretching classes,” Hopper said. Leave the fees of other gyms behind and get your workout in just down the hall. All you need to is a clean pair of shoes! Everyone has tried working out on their own. It’s easy to lose motivation when you don’t have someone to help push you along and feel the burn, Hopper said. The President’s Commission on the Status of Women is once again offering research and professional grants to students, faculty and staff of Minnesota State University, Mankato. University President Richard Davenport created the commission to support individuals who wish to improve the status of women on campus and beyond. With that, there are stipends available to conduct research and/or attend professional development opportunities concerning the status of women and gender-related issues. Liz Steinborn-Gourley, Student Success coordinator and conduct officer, says that “students working on research and creative projects particularly aimed at learning more about women and gender should consider the grant to fund their project”. She mentions that some conferences that have been funded in the past include Women in Aviation and the Mankato YWCA women’s Leadership Conference. Whether you need funding for a creative art installation or a research project aimed at learning more about women and gender, we encourage you to apply! The spring deadline for applications is Tuesday, Feb. 20 at 4 p.m. All activities using funds must occur before June 1, 2018. Commission is not able to fund equipment requests or incentives. For more information and to submit your electronic proposal, visit http://www.mnsu.edu/csw/projectyear/poyresearchgrantshtml.html or contact Liz Steinborn-Gourley (Elizabeth.steinborn-gourley@mnsu.edu). 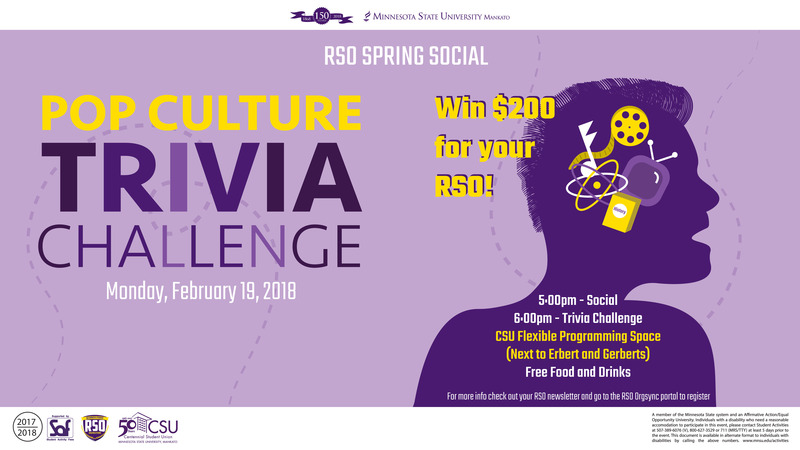 Round up your RSO (Recognized Student Organizations) members for free food and a chance to win $200 in the Pop Culture Trivia Challenge. Regardless of your proficiency in pop culture, it will be a great opportunity to bond with other organizations as well as your own. “This event is a way to explicitly set a date so that those who want to meet other RSOs have the chance and place to do so,” Lee said. The challenge is on Monday, Feb. 19 from 5 p.m. to 8 p.m. in the Flexible Programming Space next to Erbert’s and Gerbert’s. Interested RSOs should register in OrgSync by Feb. 9 using this link: https://orgsync.com/69093/forms/303257. Growing up, I had 10 television channels. Cartoons weren’t my thing and my mother’s soap operas were too corny. So, in the off chance that I was watching t.v. instead of running around in the yard with a stick (imaginary sword), it was either Food Network, or Travel Channel. I’d watch Anthony Bourdain travel the world, exploring places and eating things I had no idea could exist. Blood pudding in Ireland, foie gras in France, chicken pho in Vietnam; you can imagine the affect that had on a child from Kilkenny, Minnesota­—population 108. Coming from a humble background, I wasn’t able to get my hands on top shelf ingredients, but I made the most of what was in our cupboards. I created countless variations of the grilled cheese, pasta with red sauce, hand rolled pizzas, and my specialty, chicken and cheese empanadas. I became better and better at compiling the ingredients I had at my disposal, and even cooking for my friends every once in a while. Now that I’m in my last year of college, I’ve been looking back at how my love for creating my own meals has been a huge benefit—financially and spiritually. There’s something rewarding about coming home to a crockpot of savory beef stew that eight hours earlier was a bunch of raw, singular ingredients. If there is one thing I would pass on to underclassmen, it would be this: When you take a meal break from studying, don’t go the quick route, or at least don’t do it every day. Use the internet to teach you how and what to cook. Google recipes. YouTube instructions. Instagram the finished product. You’ll save money, feel healthier and build a connection with food and the process of creating that you may not have had before. P.S. “Anthony Bourdain: No Reservations” is on Netflix. Every season.